Croatian cuisine is heterogeneous and is known as a cuisine of the regions, since every region of Croatia has its own distinct culinary tradition. Its roots date back to ancient times. The differences in the selection of foodstuffs and forms of cooking are most notable between those in mainland and those in coastal regions. Mainland cuisine is more characterized by the earlier Slavic and the more recent contacts with Hungarian and Turkish cuisine, using lard for cooking, and spices such as black pepper, paprika, and garlic. The coastal region bears the influences of the Greek and Roman cuisine, as well as of the later Mediterranean cuisine, in particular Italian (especially Venetian). Coastal cuisines use olive oil, and herbs and spices such as rosemary, sage, bay leaf, oregano, marjoram, cinnamon, clove, nutmeg, and lemon and orange rind. Peasant cooking traditions are based on imaginative variations of several basic ingredients (cereals, dairy products, meat, fish, vegetables, nuts) and cooking procedures (stewing, grilling, roasting, baking), while bourgeois cuisine involves more complicated procedures and use of selected herbs and spices. Charcuterie is part of the Croatian culinary tradition in all regions. 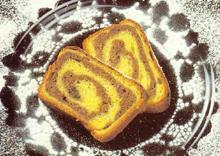 Food and recipes from other former Yugoslav countries are also popular in Croatia. Croatian cuisine can be divided into several distinct cuisines (Istria, Dalmatia, Dubrovnik, Lika, Gorski Kotar, Zagorje, Međimurje, Podravina, Slavonija) each of which has specific cooking traditions, characteristic for the area and not necessarily well known in other parts of Croatia. Most dishes, however, can be found all across the country, with local variants. Edible dormouse – eaten on the Dalmatian coast according to Bizarre Foods with Andrew Zimmern. Salted cod is imported, but dishes are very popular for Christmas Eve or on Good Friday. It can be prepared either as bakalar na bijelo (Dubrovnik, Dalmatia and Istria, with olive oil and garlic, with or without potatoes), or as bakalar na crveno, in tomato-based stew, with potatoes. Salted anchovies or sardine (slana riba) are served as hors d'oeuvres or as a part of light supper with povrće na lešo, salads etc. Stewed vegetables with a small amount of meat or sausages (varivo or čušpajz) is perceived as a healthy, traditional meal. Sour cream (in Northern Croatia) or olive oil (on the coast) can be added to the plate just before serving. Stewed meat dishes are often prepared by men in open spaces, following hunting and shepherding traditions. In Dalmatian urban cuisine, spices such as cinnamon and clove, dried plums, dried figs, apples and other fruit are sometimes added to meat stews. Pasta is one of the most popular food items in Croatian cuisine, especially in the region of Dalmatia. Manistra na pome (pasta with tomato sauce) is a staple. The other popular sauces include creamy mushroom sauce, minced meat sauce and many others. 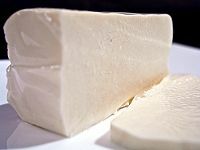 Fresh pasta (rezanci, krpice) is added to soups and stews, or prepared with cottage cheese, cabbage, even with walnuts or poppy seed. Potato dough is popular, not only for making njoki (gnocchi), but also for making plum or cheese dumplings which are boiled, and then quickly fried in breadcrumbs and butter. 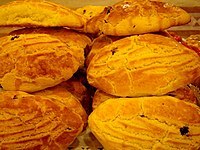 Štrukli – baked or cooked filled pastry from Zagorje, Zagreb area. 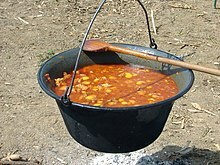 Soup is an integral part of a meal in Croatia and no Sunday family meal or any special occasion will go without it. The most popular soups are broth-based, with added pasta or semolina dumplings. They are usually light in order to leave space for the main course and dessert to follow. However, cream or roux-based soups are also popular, and there are many local variations of traditional soups. In Dalmatia, fish soup with fish chunks, carrots and rice is commonly served. Povrće na lešo (boiled vegetables seasoned with olive oil, salt and sometimes garlic) is a common way of preparing chard, kale, cabbage, green beans, potato, cauliflower, carrots, broad beans, zucchini and other vegetables as a side dish. It combines well with boiled eggs, as a lighter alternative to a meat- or fish-based meal. Viška pogača is a salted sardine-filled foccacia from the island of Vis. Soparnik is a Dalmatian chard-filled pie. Apart from imported beers (Heineken, Tuborg, Gösser, Stella Artois, etc. ), there are home-brewed and locally brewed beers in Croatia. A brewery based in Split produces Bavarian Kaltenberg beer by licence of the original brewery in Germany. Velebitsko pivo: brewed near Gospić on the Velebit mountain, the dark beer has been voted best beer by an English beer fan website. 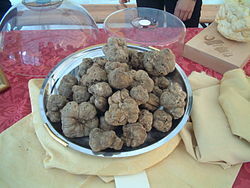 ^ Bizarre Foods with Andrew Zimmern – Croatia's Dalmatian Coast (youtube) (video). TravelChannelShows. 2015-10-07. Event occurs at 42:34. ^ Bizarre Foods - Croatia - Dalmatian Coast. ^ "Croatia's Dalmatian Coast: Roasted Rodents & Stone Soup". Travel Channel. ^ "Badel 1862". Badel1862.hr. 2012-02-14. Archived from the original on 2010-02-17. Retrieved 2012-06-20. ^ "Cedevita | Home". Cedevita.hr. Retrieved 2015-11-13. 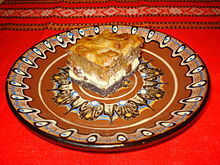 Wikimedia Commons has media related to Croatian cuisine.